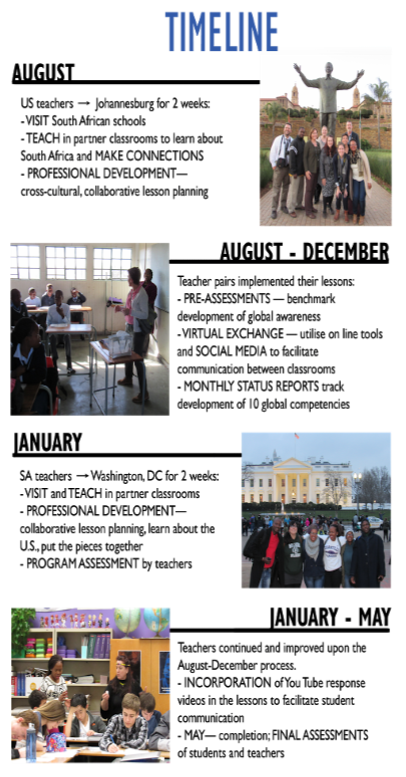 Over the last twelve months, WAC-DC has engaged in a twist on educational exchange. Instead of a one-time, single experience, we wanted to see what happened when teachers, their students, and their schools embarked on a year-long, fully immersive duel collaboration where they truly traded spaces. When we began the journey; we asked participating students what they thought about global education. The results? Based on the results we collected, we knew something had to give. We decided to turn the typical exchange ‘moment’ into a ‘movement’ in order to build students’ global competencies and provide them a cross-cultural experience without leaving the classroom, we had to start with their teachers. In 2015, WAC-DC launched the pilot Global Education Teachers International Exchange Program (GET-IEP) made possible by a generous grant from The MasterCard Foundation. Five Washington, D.C. and five Johannesburg-area high school teachers were paired up, establishing a two-way exchange and a professional development opportunity to create collaborative curriculum and work together to explore current global issues. 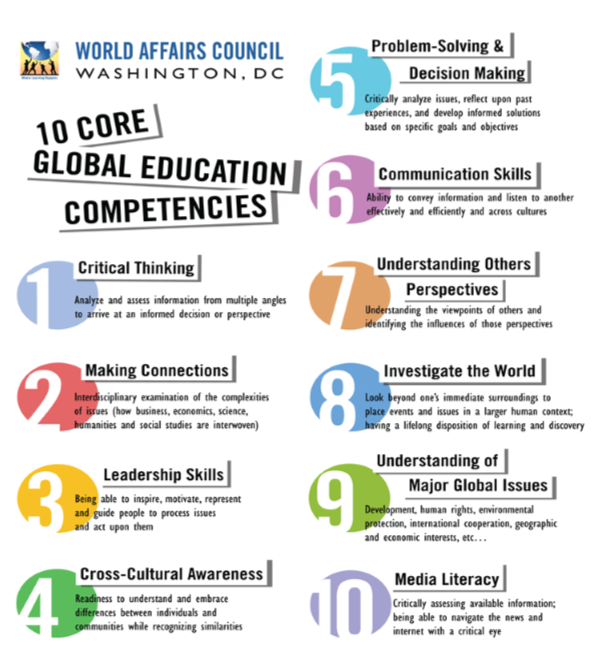 Through the exchange, participating teachers were introduced to WAC-DC’s 10 Core Global Competencies and how they could be utilized to teach students 21st century skills such as critical thinking, cross-cultural awareness, making interdisciplinary connections, media literacy, and communication skills. With feedback from WAC-DC and two curriculum specialists, teachers worked together to develop cross-cultural lessons that gave their students opportunities to learn from and interact with each other. During the program, teachers practiced new lesson planning theories, implemented meaningful integration of classroom technology, and experimented with classroom techniques to encourage discussion and forward thinking both in and out of the classroom. In order to build a meaningful exchange, participating teachers spent time in each other’s classrooms; learning and growing from their students, schools, and unique environments. The timeline stretched from August, 2015 to May, 2016. Each participating teacher became fully immersed in their counterpart’s life and work space, and in-turn, had the opportunity to reach hundreds of students either first-hand or second-hand. Both South African and U.S. teachers were able to engage in collaborative professional development which highlighted the triumphs and confronted the challenges involved in this kind of exchange. One challenge that we were confronted with as part of the GET-IEP program was that of differing levels of technological access and usage. Schools in both South Africa and the United States had access to computers and Wi-Fi, it was apparent that technological training was paramount to the success of the program. Each teacher approached the project with different relationships to technology: some immediately saw the potential to use apps such as Instagram and WhatsApp to give their students an effective means to collaborate on projects across borders while others used the GET-IEP Blackboard site strictly to upload individual student work for their counter-part’s use. As the teachers progressed through the program, GET-IEP evolved to address technological difference and found YouTube to be the most effective platform to work from. After every collaborative unit, each teacher would film a "Student Response"--short video clips of their students responding, engaging, and asking questions about the lesson. These videos were then uploaded by the teacher to YouTube for their counterpart class who would watch and discuss each video submission. By utilizing this platform, teachers did not have to worry about a lack of access to internet at their school(s) or about excluding students with limited access to technology which allowed all students to participate in the exchange of perspectives. Confronting technological issues and working with participating teachers to navigate around them propelled us to concentrate a week-long professional development seminar on technology investigating technological needs & classroom preferences that we will be applying to the launch of our 2017 GET-IEP program this year. As we begin the new school year, we plan to expand on what we have learned and provide training to help teachers utilize new technology and encourage students to explore the world and its peoples all from the comfort of their classroom.